Defense Secretary Chuck Hagel’s plans to cut back the size of America’s army to pre-World War II levels are likely to run into political opposition on Capitol Hill. The cuts are also at odds with the views of Americans who say spending should be kept as it is, or increased. Almost half (47%) of the public said military spending should be kept about the same, according to a survey conducted Oct. 30-Nov. 6, 2013. An additional 23% said it should be increased while 28% favored reductions. The findings reflect roughly the same sentiment found in a survey conducted a year ago. 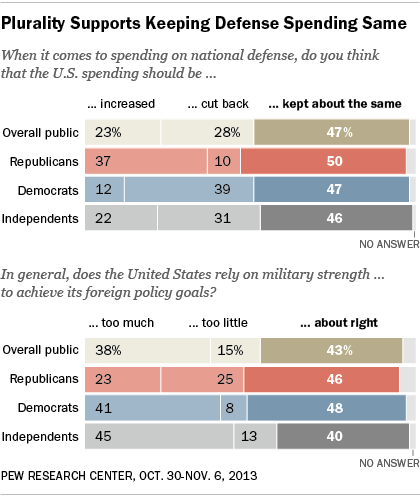 Almost equal numbers of Republicans (50%) and Democrats (47%) favored keeping military spending the same, but they differed sharply when it came to those who wanted to see increases or decreases. Nearly four-in-ten Democrats (39%) would cut the Pentagon budget compared with only 10% of Republicans, while 37% of Republicans would increase defense spending compared with 12% of Democrats. As a backdrop to the public’s views on military spending, the October-November survey found that 56% of Americans said the U.S. should ensure that it keeps its position as the only military superpower, a view that was virtually unchanged since 2009. Opinion was more mixed on the question of whether the U.S. relies too much on military strength. About four-in-ten (43%) said American use of its military power was about right while 38% said it was too much and 15% said it was too little. However, when the military spending question was put into the context of a specific choice — whether reducing the deficit was more important than funding the Pentagon at current levels — Americans said by a 51% to 40% margin that deficit reduction was more important, according to a December 2013 survey.